FAQS | Hair? Braid It! Phenomenal Girls, Phenomenal Training & Phenomenal Hair Styling. How much is it? It varies depending on the content. 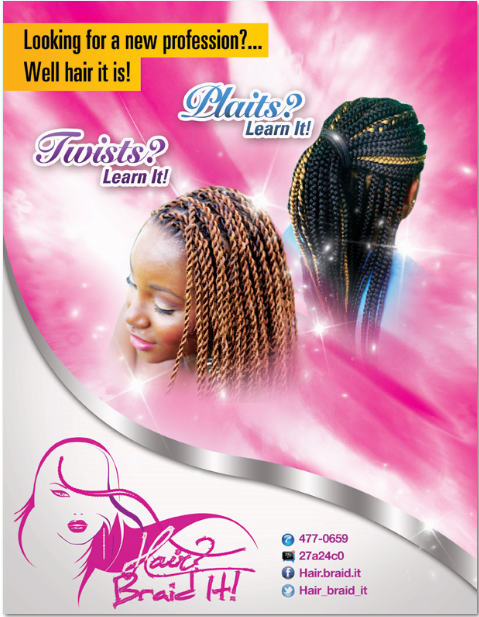 I know how to braid can I learn twists only? Yes, I separated the two to ensure that this will not be a problem. How many people are in each workshop? All workshops should have a maximum of 6 people but camps and one day maximum of 10. Registration? Please fill out the registration form, and a member from the team will reply with all details needed to make your deposit via email. What does the price include? All tools and materials provided for learning. Payment? You MUST pay 50% deposit before attending workshops you can visit the salon, use PayPal or deposit into our first citizens account. How are we rated? At the end of the workshop, you will be rated and you will receive a certificate of participation. It is important that your read notes and practice a lot as this will be reflected on your certificate which will be mailed to you.